On NOGGIN, (it's like preschool on TV!) 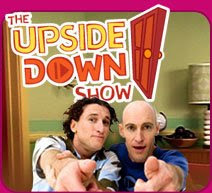 there is a show called the Upside Down Show. It's stars Shane and David. We have seen it a couple of times, and it's a little weird (but kind of neat, too) and Ed hates it! Shane and David come on TV during some commercial times, and Ed RUNS away from the TV, and this is what he does. This is what he was doing last time we saw Shane and David on TV. He also does this when the troublesome trucks from Thomas come on. He hates the train wrecks and hides his eyes. 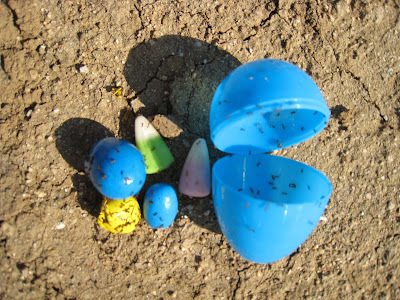 The ants like Easter, too. 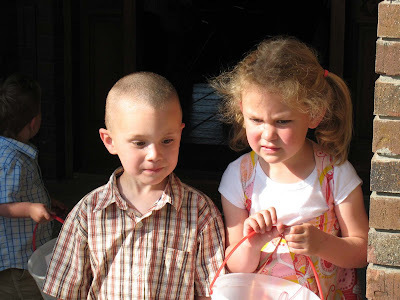 Will and Kacy getting ready for the hunt at the Bunting's house (grandma and grandpa's). 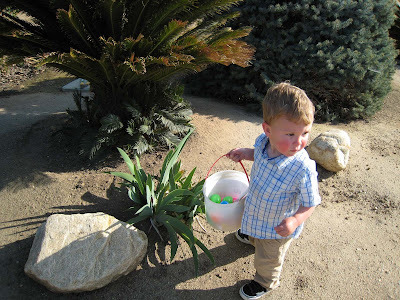 Ed liked finding eggs as soon as he realized there was candy in them. Easter was fun for all this year. We went to the Bunting's for a yummy dinner that included roasted asparagus (my favorite thing on the table this year), then we headed out to my grandma Mayhall's house for my side of the family festivities. There was desserts there- enough fat and sugar on the table to send the kids into sugar shock and the adults a diabetic coma. It was great! The Easter bunny left the kids a chocolate bunny and some Reece's pieces "carrots". Next year maybe I'll try to make matching outfits for the girl's and find matching clothes for the boys. MAYBE. This is a shot of the dwarf walls (no, it's not politically correct, but since we have come across no other name for them anywhere, the terminology is the same as in the "olden days"). These walls are what hold up the I-beams. On top of the I-beams goes the floor sheeting, and then our sub-floor is complete! That will be next weeks tasks for Ryan. My job is to paint the white stuff on the bottom of the wall to prevent moisture from seeping into the block, just as a precaution. Since I live in a 300 sq. ft. fifth wheel with five other people, four of whom are kids, I am always looking for clothing storage solutions. I found this on the good old internet, on this cool lady's blog: www.meckmom.com. 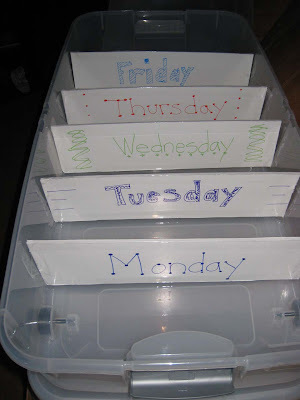 There are clothing organizers for kids that hang in the closet with the days of the week. I have no closets. This is an under-bed storage box on wheels (the kids bunks are up) with foam core board dividers. Both Kacy and Will have one, an the idea is you put one outfit for each day, and they can dress themselves. AND it's easy to put laundry away. AND you realize that your kids have too many clothes. Weekend clothes go in the back. It's been a whole week since I've written anything. I have been very busy! I have been helping Ryan as much as I can. I have been doing all my household stuff, too. 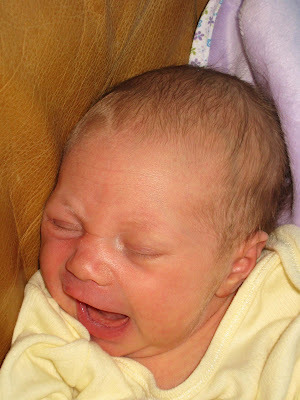 It can be hard to do anything with a newborn, but I feel like I'm doing an okay job. My house isn't as clean and organized as I like it to be, but it is still guest worthy, as long as whoever comes in knows my room is the messiest, and I'll probably have to move toys out of the way. Here are some pictures of the girls. 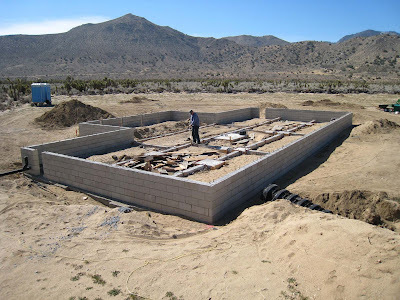 I plan on posting pictures of our house in the next day or two- Ryan has made some more progress, of course. He works on the house for the whole day, coming in only to eat. Even then, I have taken lunch out to him and he eats out at the house. Kacy and Jessie- Kacy loves her little sister. Jessie today, sitting in her dad's chair. This is how she spends her evenings- looking for food. She slept through the night last night (9pm to 6:15am!!!) and the last few evenings she has been causing me grief. She eats and eats and is awake the whole time. She cries when I put her down- she loves to eat and eat! I can't get Ed out of the bath and dressed one handed- tonight I got out my prized baby possession- the Baby Bjorn. I LOVE it. I bought it with number one, and have number four in it right now. It works great! Here is Jessie- I think I took this picture yesterday. It may have been today. I am doing very well; she is being nice to me at night by sleeping at least for one five hour stretch. 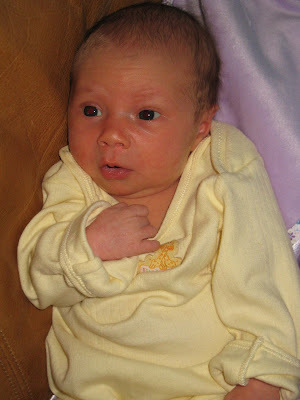 I do notice that I'm tired when I get a diaper out to change her and then can't find it. 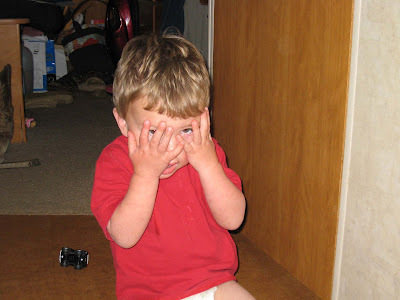 Or when I ask Kacy if I already got her the juice she asked for. Or when I put Will's clothes on Ed. But since those are minor, life is going well. My blog book came today. I LOVE it. Ryan is really impressed, I can tell. He said 30 years from now the book will be nice to have- it's pictures and words all rolled into one. Most people have photo albums, some keep journals, but the book ended up being both. Super scrapbooking without the scraps of paper everywhere. 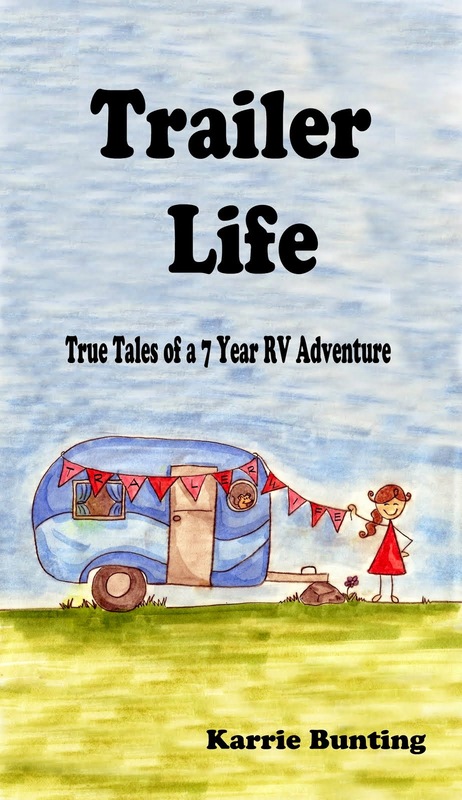 I will try to post a little more often this year just my 2008 book is more complete. Masonry wall completed! Now Ryan is busy taking off all the forms. It's a little sad really- we spent all that time digging, building forms, digging some more, and now it's all being torn down. But it's great! Ryan is going to town on Monday to pick up lumber and he's going to start framing the sub floor and all that THAT requires. So the next steps are sub floor and rough plumbing. And somewhere in there is putting the water/phone lines in and burying those, and then back filling the wall in the picture. That will take about a day- not too bad. It's nice having Ryan have one month off, especially with the new one. He gets up early with the kids if I've had hectic night. He also helps with the cooking and older kid watching. Very helpful. Jessie is a good baby, as far as the last 6 days have gone. 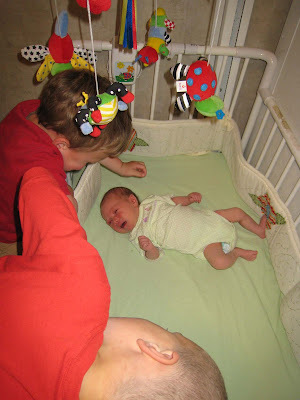 The typical baby stuff-eat, sleep, diapers, repeat. Me: "I have been having contractions five minutes apart for an hour and they just got a bit unmanageable." Nurse: "Unmanageable? That's an interesting way to put it." Me: "Well, I have to think about them now." Nurse:"Is this your first one?" Me: "No, it's number four." Nurse: "Has your water broke or are you spotting?" Me: "Nope. But with number two I walked in at 8 cm with none of that." Nurse: "It sounds like you should come in then. We'll be waiting for you." I go tell Ryan, Jocelyn and I get our picture taken to compare bellies (I HATE those! I look so bad!) and then we leave. My water breaks on the way, I joke with Ryan about how labor contractions are funny because it doesn't hurt unless you are having a contraction, and if they are five minutes apart, you get five full minutes of rest. And, that if I get to the hospital and I'm four cm dilated I'll be upset and I'll ask for pitocin. Five or ten minutes later we get to the hospital and pull in front. I step out of the van and find that I can't make it. I tell Ryan to go get a wheelchair. He comes back and says "There is no one in there!" I do a funny waddle-run to the doors (with wet pants- NICE!) and get in the elevator. One floor up and I kind of lose perspective on what happened. I know I was thinking I was going to have this baby in the elevator and how was I going to get my tennis shoes off and where is everybody? I tell Ryan to go get someone and he tells me to hold the elevator door. I somehow make it the two feet to the door and after about 20 seconds a nurse comes from the opposite direction with a wheelchair. 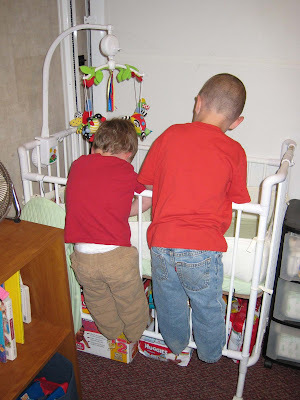 They RUN me to the first open door where I jump on the bed and tell the nurse that the baby is falling out. She says no, she's not. (I still beg to differ, and my sister Kendra said "I hate those nurses. They don't know anything. As a side note, she had number two in the car, and the doctor missed number three and four.) The doctor came in and Jessie fell out. There was no holding of the legs back, or pushing your chin to your chest, or counting to ten. Just "Oh! There's the head!" and then she was born. (See- she did fall out.) We were stuck in our office room for four hours until we got put into a real room. By then it was too late for visitors, so we had a quiet evening. Ryan was so bored because the room we were in for the delivery didn't have a TV or anything. I still need to talk to Ryan to get his side of the story because I know that as soon as I got into that elevator, I lost a good part of my concentration on what was going on. This is Jessie. She was born Sunday, March 02 at 5:23pm. She weighed in at 7 pounds 5 oz, and 20 inches long. She is our smallest child yet, and she was almost born in the elevator. We made it to the the "triage" room, which was an office with two beds in it. That will be another post entirely.